Bill and Brenda (Beni) Johnson are the Senior Pastors of Bethel Church. Bill is a fifth generation pastor with a rich heritage in the things of the Spirit. Together they serve a growing number of churches that have partnered for revival. This apostolic network has crossed denominational lines in building relationships that enable church leaders to walk in both purity and power. 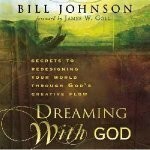 The present move of God has brought Bill into a deeper understanding of the phrase, "on earth as it is in heaven." Heaven is the model for our life and ministry. Jesus lived with this principle by only doing what He saw His Father doing. Learning to recognize the Holy Spirit's presence, and how to follow His lead will enable us to do the works of Christ, destroying the works of the devil. Healing and deliverance must become the common expression of this gospel of power once again. Bill Johnson and the Bethel Church family have taken on this theme for life and ministry. Healings, ranging from cancer to broken bones, to learning disorders and emotional healing, happen with regularity. This is the children's bread. And these works of God are not limited to revival meetings.